David Wright, Readers’ Services Librarian at Seattle Public Library, was selected as the 2017 NoveList’s Margaret E. Monroe Library Adult Services Award winner for his outstanding contributions to readers’ advisory and adult services. 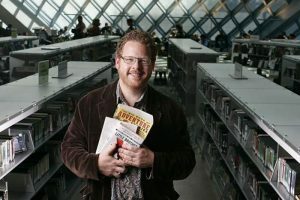 As a passionate and influential library practitioner, Wright embodies what it means to be a true Readers’ Advisor through his writing, teaching, and particularly through his daily practice of working with readers at the Seattle Public Library. A practiced speaker, Wright is known for his witty, detailed, and always thoughtful presentations on connecting readers with books and resources that will interest them. “David really captures the spirit of Margaret Monroe, as a patient teacher, a thoughtful presenter, and, above all, a reflective practitioner in the field of library services to adults,” said Barry Trott, selection committee chair. Wright is also known as the “he” in the Booklist column, “He Reads/ She Reads,” in collaboration with Kaite Mediatore Stover, also known as the “she”. Sponsored by NoveList, this award consists of $1,250 and a citation, which will be presented at the RUSA Achievement Awards Ceremony at the ALA Annual Conference in Chicago in June. The NoveList’s Margaret E. Monroe Library Adult Services Award selection committee includes: Barry Trott (Chair), Jennifer C. Boettcher, Larayne J. Dallas, and Diane L. Mohr.